The big highlight of 2007 for me was the "Everyman Race" as part of the Rund um den Henninger Turm race - 18 months after I had been lying in agony in hospital with severe paralysis of the right leg. If I had to choose a "great day" in my life, one that really beats all the others, I couldn't. But this one would certainly be on the short list. 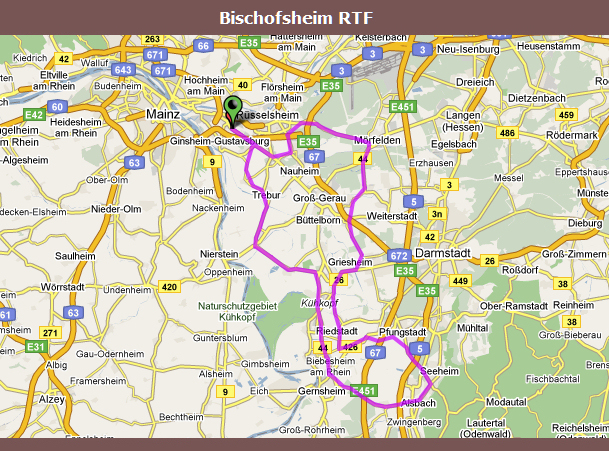 By way of explanation: I like to do what Germans call RTFs - Radtourfahren - which the French call "cyclotourisme" and the Brits "sportives". They're basically routes marked out in advance by cycling clubs, usually 5 different courses with distances ranging between 40 and 200 km at the same event. They are not races, the roads are not closed to traffic, and riders start the course at any time they wish on the day. There are feeding stations and check-in points every 30 km or so - always a welcome sight. Generally held on a Sunday and with a couple of hundred particpants and more as a rule, an "RTF" is a great way to spend the day. The .kmz (Google Earth) links should open Google Earth directly if you have it installed on your computer. Click on a map's title to load the full map at bikely.com. Mid-April - more preparation for May 1. This was to be the first time I cycled more than 100 km in one go. A flat course (the "hill" you can see was a motorway bridge if I remember rightly) and windy in parts. I spent most of the time providing protection from the wind to a lady (there's a joke in there somewhere I guess ...). 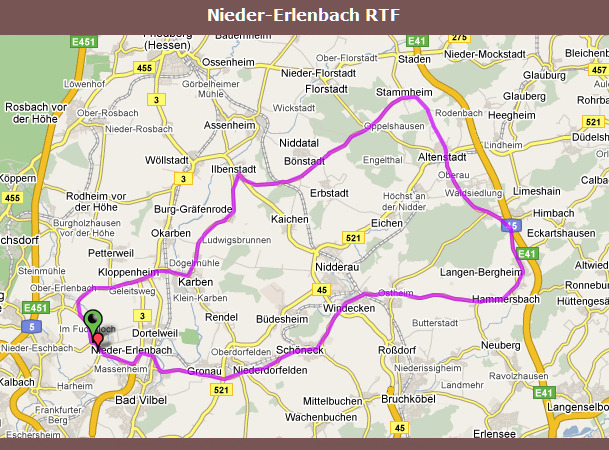 Open route using Google Earth This annual classic for professionals is held in Frankfurt on May 1, with various courses for hobby cyclists using parts of the actual route ridden later in the day by the professionals. The great thing is the fact the roads are closed to traffic - advisable really with 3000 cyclists and 800 inline skaters tearing along. And this is it. Race day. Can I achieve my goal of an average speed of 30 kmh? A 15 km ride to the start is the perfect warm-up. The riders doing the longer (100 km) course set off first, then it's our turn. Lots of big groups mean plenty of slipstreaming. Lots of people lining the course mean plenty of motivation. Fast speeds in groups going into corners mean plenty of adrenaline. Two and a quarter hours go by in a very long flash. I actually managed an average speed of 30 kmh (just under 20 mph). The best riders averaged well over 40 kmh! A few days after the race on May 1 so I decided to take it easy, a nice 15 km ride out to the start, a brisk (and windy) 70 km ride, some coffee and cake, and then the 15 km back home. 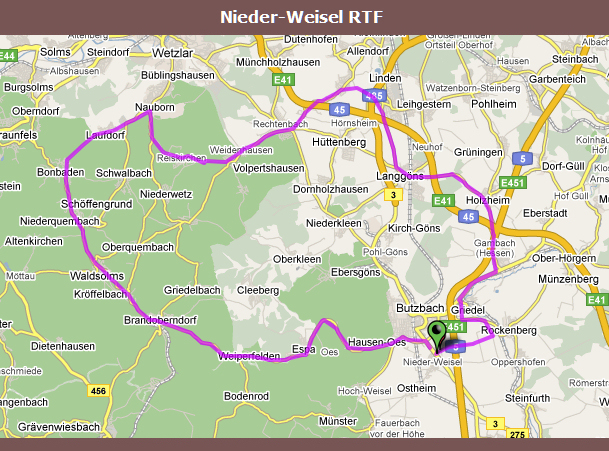 The longest I'd ever cycled to date in one sitting - a beautiful ride through the Vogelsberg region. Great refreshments at the feeding stations (don't laugh - you need those carbohydrates and fluids when you're in the saddle for 6 hours and more). I'm coming back next year - for the marathon. For those of you who think that a distance of nearly 150 km sounds like a marathon, it's not. A cycling marathon has to be at least 200 km. Another long ride with plenty of climbing to be done, culminating in a ride up to the "Sandplacken" - compensated for by a long downhill section at the very end. I was actually going to do a longer course, so the night before I'd eaten plenty of pasta in preparation. I got up on the Sunday morning at 6ish and looked out the window. Rain. Persisting it down. Ah well, methinks, better shift some of that pasta. At least the rain let up a bit. Still a pretty wet 75 km mind. And the other cyclists are few and far between. No streamlining today! 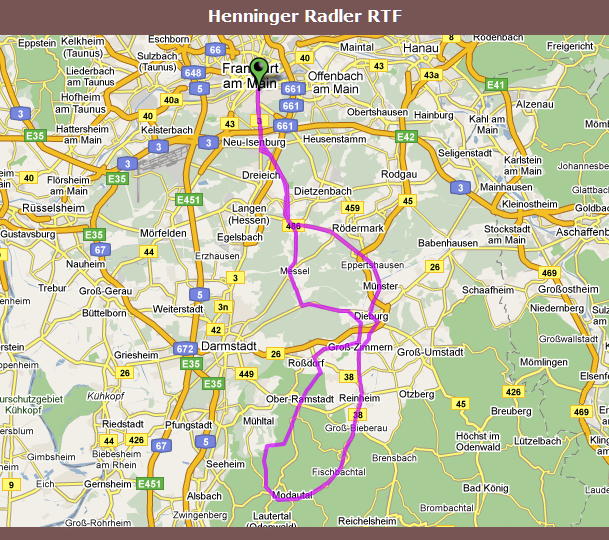 Open route using Google Earth I did this little tour whilst on holiday in what was eastern Germany. I'd already done 50 km before breakfast (just a little detour on my way to the bakery!) and after a leisurely breakfast I felt like having a longer ride ... Pretty flat countryside, quite sparsely populated in parts, with lovely tree-lined avenues. I included a section of the Havelland Cycleway which goes though the Luch, a sort of marsh area with lots of rare wildlife. 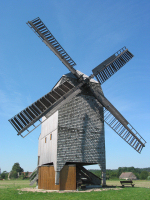 The ride was marred only slightly by a 20-minute stop to repair a puncture after about 70 km. 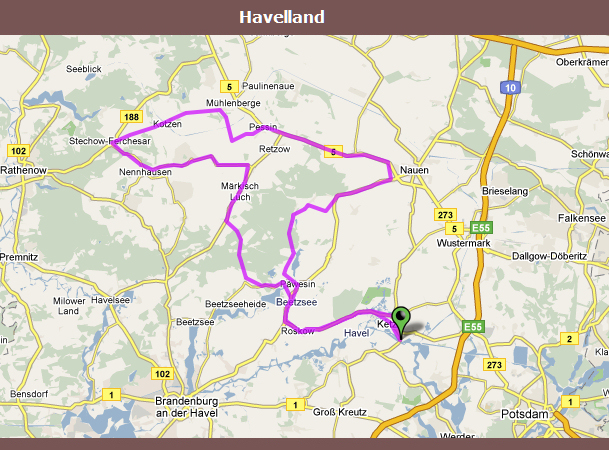 Here are some of the photos I took of the region: Havelland photos. Whenever I'm home in England I like to get a bike out and cycle up and down the Wolds. There is something invigorating about those rolling hills and the occasional glimpse of the sea. Boxing Day 2007. The day everyone goes for walk with their loved ones and family. I went for a ride with my loved one. The Silver Bullet. Hardly any cars on the roads - what a joy.